This is the farm's first pineapple of the season. It is a special variety called the "White" or "Kona Sugarloaf". It is a sweeter and less acidic fruit than what you normally buy fresh in the grocery store. It also is core less-you get to eat every wonderful bit. Kona sugarloaf is a very tender and must be picked completely ripe to be at its special best, so it is rarely seen in commercial production, since it doesn't travel well. 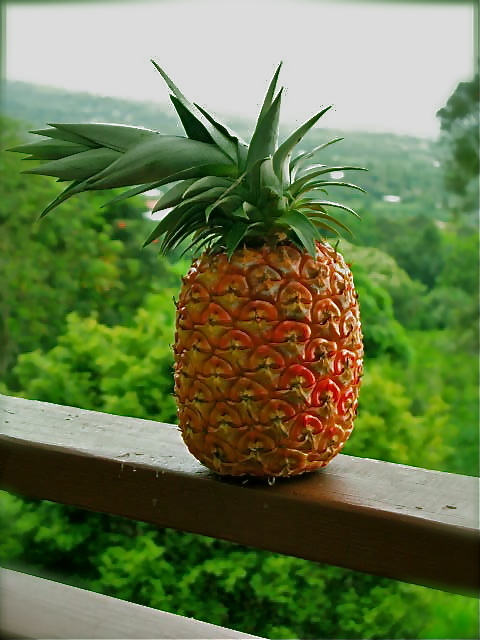 Pineapples come from a tropical plant family called bromeliads. The gray-green plant grows 3 to 4 feet tall and around, with narrow, long, stiffly pointed and tough leaves. It is not a particularly friendly nor pretty plant, though gets more interesting looking when its flowers off of a central stem that rises above the leaves. The small, pink and orange fruit, starts out looking like a thistle, then as it grows it looks just like a pine cone, gradually increases in size and girth over a year or two. Here at Left Coast Farm, pineapple cultivation is simple-find a sunny spot out of harms way (harm to human legs, not the sharp edged pineapple plant! ), add soil (all soil here is imported-we got rocks only) and plop in the crown of a previously consumed treat. After a couple of years of benevolent neglect, dessert is yours. Much easier than the method utilized in Victorian era England, when specialized "pineapple pits" were the rage on upper class estates. Three large trenches were covered with glass frames and with the pineapple plants in the middle ditch, the outer ones were filled with fresh horse manure-about 30,000 pounds of it. The heat from the composting manure kept the pineapples in humid and warm, if not fragrant, splendor.